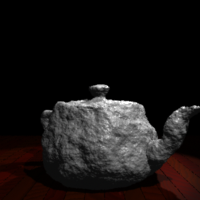 I've been meaning to update the ngl::Texture class for a while, a lot of time the texture class is used to load and image then load it into an OpenGL texture. Sometimes we just want an image and not access to OpenGL. I've just split the two classes to have a separate image class and the Texture class is now much simpler (and in some cases can be ignored). To allow the loading of different images I've usually used the QImage class in Qt, this works really well and is simple to use, however sometimes I port my code to platforms that don't use Qt (raspberry pi for example) and I have to use another library. To this end I decided to support 3 different loading libraries QImage (the default), ImageMagick and Open Image I/O. The code to load the images is quite simple, and uses a boost::scoped_array to store the data as a contiguous block of unsigned char data that OpenGL can use as texture data. The source code can be seen in Image.cpp and Image.h and the video below shows how to change the Qt Project to set the image library to use.